This one is for all you car junkies and car lovers. 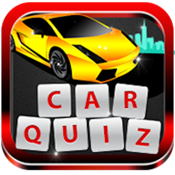 Think you know your cars, then try out this simple photo quiz game for some of the top all time cars. Lamborghinis, Ferraris, Renaults.. Everything is there. You get 4 pics to guess the correct name of the car. Great graphics to perfectly suit your device. Try to get the car name correct using least number of pics. The game is totally free, but if you run out of credits than you might have to complete an offer to get credits or wait for daily bonus. Look forward to interesting updates. If you have any ideas for improvements, please share at support@mobieos.com.